È un rapace di forme compatte con ali ampie e arrotondate e una coda piuttosto corta. Il colorito è bruno scuro superiormente e molto variabile inferiormente; solitamente la superficie inferiore delle ali è bruna leggermente barrata di nerastro con macchia scura al polso e area chiara sfumata al centro, mentre la coda presenta numerose sottili barre scure. Preferisce i boschi, ma di solito caccia in territori aperti. Mangia soprattutto piccoli mammiferi, serpenti, lucertole e, talvolta, carogne di animali. La poiana costruisce un solo nido sugli alberi e su rocce isolate. La femmina depone solitamente 2 o 3 uova nel nido tra marzo e maggio. 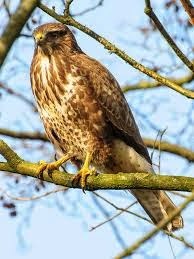 The Common Hawk is a medium sized raptor, usually in shades of brown with a pale “necklace” of feathers. The Common Hawk breeds in woodlands, usually on the fringes, but favours hunting over open land. It eats mainly small mammals, and will come to carrion. A great opportunist, it adapts well to a varied diet of pheasant, rabbit, other small mammals to medium mammals, snakes and lizards, and can often be seen walking over recently ploughed fields looking for worms and insects. They build their own nests, which are often constructed out of sticks and other materials they can carry. Nests are generally located in trees, which are generally selected based on large sizes and inaccessibility to climbing predators. Most Common Hawks breed in stable pairs, which may mate for life or at least for several years even in migratory species in which pairs part ways during winter.